There are a lot of nice animals out there but at the same time there can be a lot of problems with some of them when they show up and cause damage to your property, which is actually something that can happen quite frequently. If you happen to be unsure on how to remove these pests yourself, it is still quite easy to just hire the right animal pest control company to take care of the job for you, since it is clear that they have the tools and the experience to ensure that such problems do not occur. Of course, you are going to need to go out of your way to find one of these companies, which should not turn out to be so troublesome either, especially if you happen to live in an area where animal control is a big problem. Well, then all you need to do is find a good company like that ad pay them to bring in an extermination team to get rid of the animals in your home or if possible remove them peacefully. Just make a search online and you should be able to get this done in a short amount of time. When it comes to handling those annoying little critters that have a way of getting into your home uninvited, it can be a bit frustrating and chances are you will want to find a good way to make sure they never come back. This is especially the case with insects such as termites that can cause a lot of damage around the property and could even lead to the downfall of your home if you did not get rid of the infestation in time, Needless to say, if there is an infestation of pests in your home you will probably want to figure out a good way to find a solution as quickly as you can. Well, the good news is that there are actually a whole lot of pest control companies that you could choose to hire for a task like this and it would not really end up costing you that much money in the first place. All you would have to do is bring in an extermination team and get everything rolling. Within a short amount of time you will no longer have any trouble with any of those pests getting into your home when they shouldn’t be there. With all of the different pest control businesses in the Toronto area which you will have to choose from, it will be important to make sure that you select one that can provide you with the very best services at a reasonable overall amount. If you need pest control services as soon as possible, you will need to start looking for a local company that can provide you with exactly what you need to get rid of the pests that have become a nuisance in your home. No matter which type of pests you have in your home, it will be very important to make sure that you take the time to find the right company to get rid of them. You should take the time to go online and look up a few different businesses in this area that offer these services and narrow down your options based on how much each one charges and also how much experience they have. You will absolutely want to know that the people you hire to get rid of the pests in your home have done this sort of work many times before. In the end doing all of this research will certainly benefit you. If you happen to be looking for a local business to remove a raccoon that has managed to get into your home, there are going to be a lot of things to consider about some of these companies before you can choose the right one to go with. Those who need these services will want to get quotes from a few different businesses in the area so they can see how much they will end up paying each one to do this sort of work for them. You should also make certain that you hire experienced professionals to remove the raccoon in your house, and also find out if the business you are interested in hiring charges extra for each additional raccoon they have to remove if there is more than one. Those who are concerned with how the raccoon is going to be removed should get this information from each of these businesses as well. It will be important that you select a local wildlife control business that traps these animals humanely and goes about releasing them correctly. There are going to be lots of these businesses to consider, and it will be important that you choose the very best one possible. 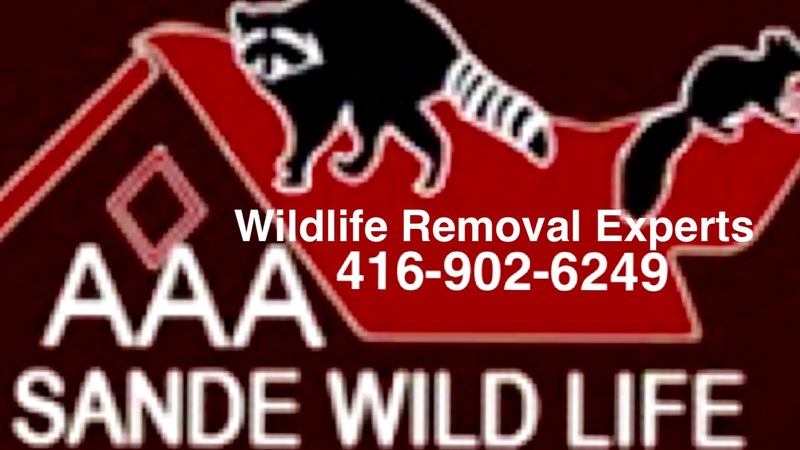 AAA Sande Wildlife Control Is Pest Control Perfection. Pest control services in Toronto should definitely be checked out before hiring. First take the time to look at the pests they specialize in. Hiring the best choice for your immediate needs is mandatory. In Toronto there area a lot pest removal businesses. Not all can provide you with the services you need. It’s very important to avoid choosing just any pest control service. If you are currently dealing with Wildlife, Bugs or Rodents you a qualified service provider for each. So make sure you hire the right service provider. Make sure that you get quotes from some of the best pest services in Toronto. Search on Google Maps for local Pest Control services in your area. Once you have taken the time to do some of this research, you should be able to decide by the reviews a company has. Public opinion should always guide you to a good service provider. You should also make sure to ask for proof of licensing and insurance before choosing to hire. Pests have many meanings for those in search of services. Most pest control is services for Mice, Rats and Bugs, however, Pests is also for Raccoons, Squirrel and Skunks as well. A service provider who deals with Wildlife control is a much better choice for pest control for Raccoons, Squirrels and Skunks. Pest control services tend to use poison in their treatment methods, and who wants to smell a dead animal in their house. Even when pest control services provide humane treatment for Wildlife, most pest control services do not know much about the proper procedures to exclude Wildlife from your property. The services at AAA Sande Wildlife Control never use any types of poison with their services. Our humane Pest removal services are in place to avoid any injury to the Wildlife we handle. 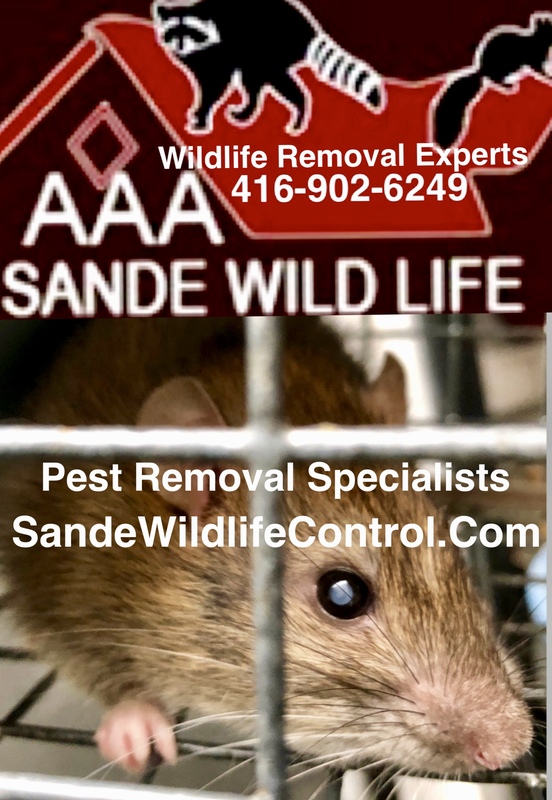 So if you want a quick and effective solution to your pest issue, call one of the best services in Toronto which is AAA Sande Wildlife Control.